"Ma," asked Hosh, "Why are some Dahee yellow, while others are white?" "Dahi is generally yellowish when made from cow milk and creamy-white when it is made from buffalo milk. There can be other reasons too." "Like, food coloring may have been added to milk, or milk was left to simmer on low heat for longer before it was cultured. In both these cases, the resulting curd will be paler." "Traditionally, Dahi is made from full-fat milk and gets its thick texture from setting in clay pots. These vessels are cheap and for one-time use." "As they have a porous texture, moisture is absorbed by the container, especially as Dahi tends to exude some whey while setting." "The use of these earthenware pots gives Dahi a "muddy" flavor and a thicker texture, which is much appreciated by the people in the Indian sub-continent." "Since this type of Dahi is expensive and impossible to find in western countries, many people just buy yoghourt and using the same straining process as used in making Labneh or Greek yoghurt to get a fair approximation of the real curd. This is still perfect for Raita, or other yogurt-based dishes." "But you can't get authentic traditional Dahi by just draining off excess liquid from bought yoghourt, as there are important differences between traditional or household production and industrial production." "Homogenized milk is used in industrial production by the urban dairy plants. This gives a much firmer Dahi, which is generally preferred. The starter culture used contains lactic acid bacteria like Streptococcus thermophiles (Greek for 'twisted berry looking, heat loving'), Lactobacillus acidophilus (New Latin for 'acid-loving milk-bacterium') and Lactobacillus bulgaricus etc." "Different people have different recipes for preparing Dahi. For example, in Nepal, acidification develops from natural flora living on the surface of vessels. No starter is used. Dahi is called Sho in Nepal and Dein Chin in Myanmar." "The Nepalese earthenware pots, called "Katara", are not for one-time use. They can hold from 200 gm to 5 kg of Curd. The Katara are washed with hot water before use, but not sterilized." "Other differences exist even in the pretreatment of milk. In Bangladesh, milk is heated close to boiling temperature for 4–6 hours in order to concentrate milk proteins before coagulation." "In Fiji, on the other hand, some skimmed milk powder is added to milk before the heat treatment to increase the dry matter of yoghurt and then to improve its firmness." "Obviously Dahi and Dahi derivatives made from such diverse processes will look and taste different. But you can change the taste and flavors of Dahi and its derivatives, just by tweaking the spice mix that goes in them too." "Regardless of the distinctions in the preparation of Dahi, most Lassi flavors are cheap, fast and easy to prepare, healthy, versatile, nutritious, and delicious. You can also serve them to almost anyone, anywhere, anytime. Let me show you a simple, yet tasty Lassi recipe today." "We're using mint as our primary flavor today," she continued as he assembled the ingredients, "though mint provides a lot more goodness to any beverage than just its flavor." "Mint is a necessary ingredient in Touareg tea, a popular tea in northern African and Arab countries. Even alcoholic drinks sometimes feature mint for flavor or garnish, such as the mint julep and the mojito. 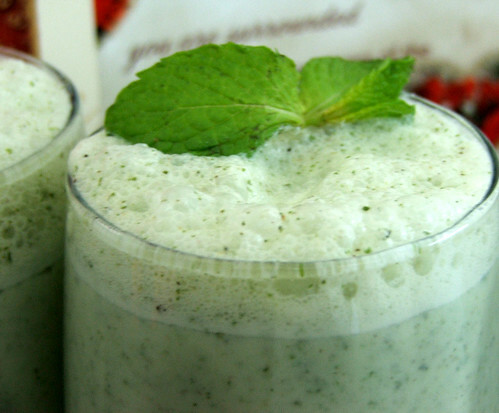 Crème de menthe is a mint-flavored liqueur used in alcoholic drinks such as the grasshopper." "Mint is reputed to be a medicinal herb. It has been used to treat stomach ache, chest pains and could be beneficial in treating irritable bowel syndrome." "It has several uses in traditional medicine. Menthol and mint essential oil are also used in aromatherapy which may have clinical use to alleviate post-surgery nausea." "Mint essential oil and menthol are also extensively used for their fragrance in breath fresheners, cosmetics, drinks, antiseptic mouth rinses, toothpaste, chewing gum, desserts, and candies like mint (candy) and mint chocolate." "Although it is popularly used worldwide in many preparations and products, mint may cause allergic reactions in some people, inducing symptoms such as abdominal cramps, diarrhea, headaches, heartburn, tingling or numbing around the mouth, anaphylaxis or contact dermatitis." "So, ask people if they are allergic to mint, before you serve it to them. I'm not, and neither is anyone in our family. I prefer to use fresh mint, as fresh leaves have a warm, fresh, aromatic, sweet smell and leave a cool aftertaste. But you can use dried mint if fresh is not available." "What gives mints their characteristic perfume is menthol (in species like Peppermint and Japanese peppermint) or pulegone (in species like Pennyroyal and Corsican mint)." Hosh had assembled all the ingredients and was ready now. "Blend pudina," she said, "in a food processor or blender, using two spoonfuls of curd. We use a little curd initially so mint is crushed completely and quickly, but we don't want to blend all Dahi too much as it turns frothy otherwise. We don't want it frothy." "When mint looks well blended, add the rest of the ingredients including any optionals you want. Blend for a few more seconds to get uniform consistency in your drink." "Try out combinations of the optional spices, and you'll find a combination that you love best. Garnish and serve chilled. This recipe should serve two." "This Lassi is great as a digestif, a starter, a small meal, a quick meal, and for when you don't want to cook a meal. It is also just what you need in those hungry moments, when you can't be bothered to eat, much less cook."